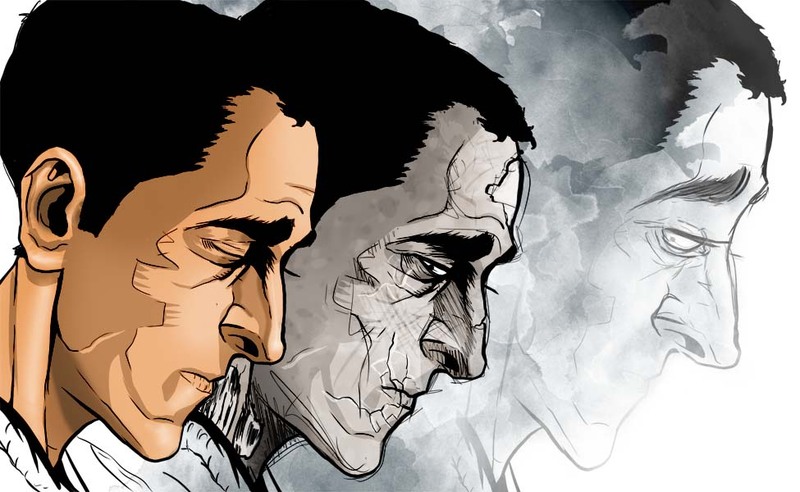 Tethered is an existentialist zombie original graphic novel created by writer David Faroz Precht and artist Danny Luckert with lettering by Lindsay McComb. 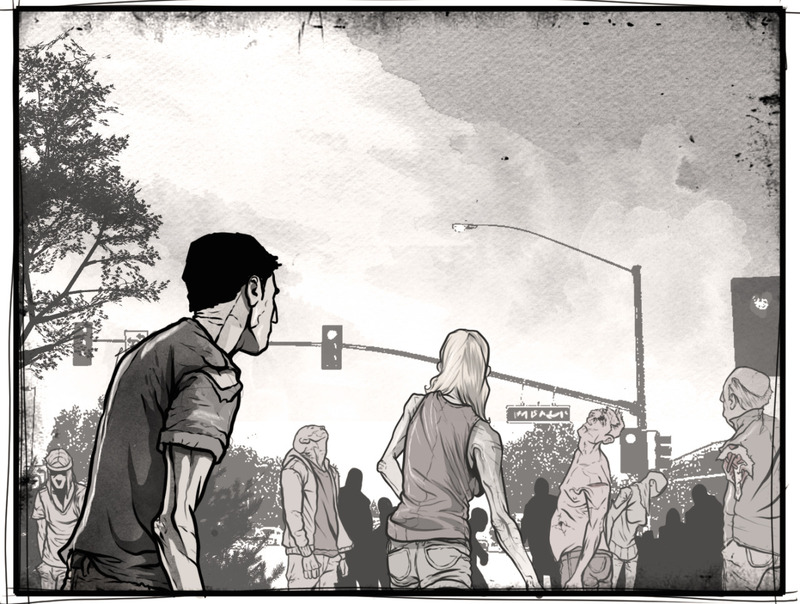 The story centers around two 20-somethings in Colorado “living” after a zombie apocalypse as “souls” tethered to their zombie bodies, experiencing the horror that their former bodies exact. We sat down with David Faroz Precht, and asked him a few questions about being a creator and his journey to becoming a creator. We’ll be interviewing artist Danny Luckert soon! Shortboxed: You sit down and you’re deciding poetry, prose or comics. Why comics? DP: I like comics. Visual storytelling was always more effective to me than prose, and it forces me to use an economy of words, which was something I still need to work on. Plus, I think visually. Mostly in moving pictures but often in static images. For Tethered, we were able to add a layer of depth that wouldn’t be afforded if it were a prose book. We juxtaposed the visual horrors of this zombie world with the blasé thoughts and observations of the characters. It also means we can jump back and forth between a conversation among the living and those thoughts that our main characters are having without it becoming confusing. Shortboxed: Were you an avid comic book or comic strip reader when you were younger? Do you remember your first comic book store experience? What was it like? DP: I read Calvin & Hobbes religiously (my grandparents would mail me clippings of strips since my parents didn’t get the paper) and a lot of comics. Started in the 90s after watching the Batman and X-Men cartoons. I read a lot of X-Men, but got back into comics in college after a lull of six years or so. I used to read, and sometimes buy, comics at the White Hen (a convenience store in the Chicago burbs), a couple blocks from my elementary school. I’d bike over after playing baseball with my friends and stand there, reading whatever they had. I’m forever thankful that they didn’t throw me out for browsing. 3.) When you pitched me – you called it a zombie story about philosophy. Where did the need to tell that specific story come form? What were your inspirations? They announced the Walking Dead TV show, and I was excited that there would be comic book property on TV but didn’t love zombies. Inspiration hit me in the shower when I realized that the zombie story I wanted to tell would have to be focused on what I felt was true of zombies and that was existentialism. My favorite existentialist writer is Camus, so I reread The Stranger and Tethered came from that. Shortboxed: The path to publishing, especially self-publishing is different for every creator. Can you tell us what your journey was like? Do you have any advice for others looking to do the same thing? I’d say use the hell out of Tumblr and Reddit. The communities are vibrant and supportive. Make sure you tag everything you post and follow other comics on Tumblr and engage in conversations on Reddit. Being active can be exhausting if you have a full-time job, but it’s important to remind people of what you’re working on as often as possible. Using Twitter, Facebook and other social media is just as important. I’ve built some solid friendships through social media of people whom I love and respect. It sounds kind of shystery, but reaching out to comic “pros”, editors and the media is really important. The more you talk with them, the more likely they’ll offer advise, support your work and reciprocate the sharing/retweeting of stuff. Shortboxed: Without giving away the ending of the story, there is a fairly explicit and troublesome scene – when writing that scene, did you anticipate a sort of reaction? What should other creators expect outside of the creative process when it comes to pushing the envelope? DP: Yeah, that scene was difficult to write but MUCH more difficult to see. I got Danny’s page while standing in line at an IKEA and was worried that we went too far. I thought it would be too upsetting and we should pull back. Danny explained that he already did pull back, which made me feel like a monster. But, after rereading the book from start to finish, I’d say that scene was the culmination of the story and needed to happen. It wasn’t gratuitous as much as necessary, painful as that is to say. When I’ve pitched the story to friends I often say “please don’t hate me for the ending” or “warning, this is an upsetting book.” To everyone else I’m more timid. I’m pretty scared of what that scene says about the culture we live in, since that’s where a lot of the book was born of. Lindsay (letterer and my wife) has talked me through not being ashamed of what I wrote and reminds me, often, that the terribleness on the page isn’t a reflection of who I am. So, my suggestion is, if something scares you when you’re writing, it’s probably good. If you’re worried that you went too far, talk to someone about it and they’ll likely support you. Talk to people. The world is sometimes a horrible place and, as creators, we can get lost in the mind of a character. Always talk it through. You’re not a monster, your character might be though. That said, pushing the envelope for the sake of getting a rise out of people is pretty stupid. It’s often much more shocking to write what comes naturally in a scene than forcing something. The Shortboxed Top 5: We ask every creator what their top 5 desert island comics are, and why? (trades, graphic novels or mini-series are all game). I rarely reread books, so I’d go with books I haven’t but have always wanted to read (and I’m assuming I can cheat with collections). Read all of Tethered right now. Files are recommended for color devices only. We are currently working on optimizing for ePub and, if you’re interested in that file type, email us at tetheredcomic@gmail.com and we’ll holler when it’s ready. Set up a PayPal account.